A party isn’t a real party unless you have some great food. The Street Jam and Carnival did not disappoint. Jackson State University annual Street Jam and Carnival mysteriously appeared on Oct. 31 when Halloween is observed. With the homecoming tradition landing on this day, it added more excitement to this year’s homecoming week. Organizations lined the Walter Payton Recreational Complex from 5-10 p.m., with food, games, music and, most importantly, fun. The street was crowded with students, faculty, alumni and trick-or-treaters from the community. Music and organizations were the highlight of the night. There were a variety of different tables students visited for various foods and participate in numerous activities. Jackson State Class of 2019 sold fishplates. 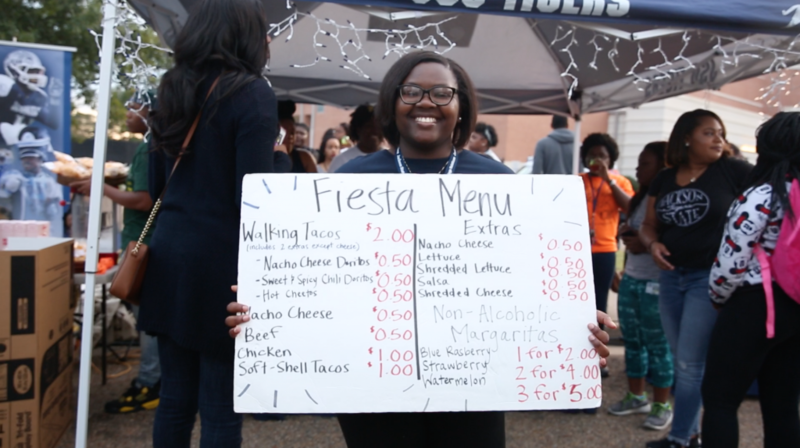 JSU Dance Ensemble sold chicken on a stick. Some would say the highlight of the night were the Pre Alumni Council’s chicken, fries and drink combo. Alpha Kappa Alpha Sorority Inc. sold white chocolate apples, cake pops and a number of other sweets. Along with the food, there were numerous activities students participated in. The International Organization provided Henna tattoos. Phi Beta Sigma Fraternity’s dunk tank left some participants wet, and the men of Omega Psi Phi Fraternity Inc. engaged the crowd in hoops. To view a roundup of other Homecoming events, click here.